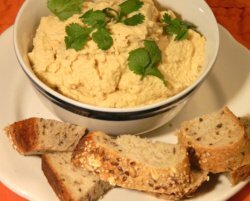 Hummus is great to use as a sandwich filling, to spread on a tortilla, bread or on whole grain crackers, or to use as a veggie dip! Blend the following ingredients in a food processor until smooth. Keeps refrigerated for up to two weeks or more.